Sir Edmund Hillary was New Zealand’s greatest adventurer, dedicated humanitarian and environmentalist. Hillary and Sherpa Tenzing Norgay were the first humans to reach Earth’s highest point, the summit of Mount Everest. Hillary was knighted the same year for his accomplishment. 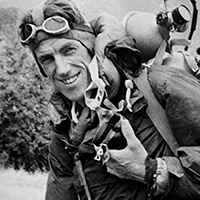 He climbed a further 10 peaks in the Himalayas between 1956 – 1965. Further to his climbing accomplishments, Hillary also reached the South Pole in 1958, becoming the first man to stand at both Poles and the summit of Everest. Hillary has committed much of his life to humanitarian work, and his achievements are truly an inspiration. “You don’t have to be a fantastic hero to do certain things…you can just be an ordinary chap, sufficiently motivated to reach challenging goals."